bl.uk > Online Gallery Home	> Online exhibitions	> Asia, Pacific and Africa Collections	> English Church, Kandy. 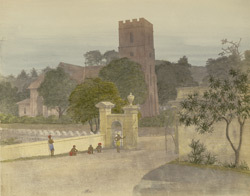 Photograph by Frederick Fiebig from an album of 70 handcoloured salt prints, showing the English Church at Kandy in Sri Lanka (Ceylon). Fiebig, of German origins, was active in Calcutta as an artist and lithographer in the 1840s. Little is known about his life, but turning to photography in the late 1840s he produced hundreds of photographs by the calotype process, frequently handcolouring them. His photographs of Ceylon, probably taken in 1852, are considered the earliest surviving photographic record of the island. Kandy, a capital of the Sinhalese kings from the 16th century till the advent of British rule in 1815, was for centuries a bastion of Sinhalese culture. Located at 500 ms or nearly 1700 ft in altitude in Sri Lanka's central hill region, the town has a pleasant climate and its famed late 17th century Palace Complex includes the revered temple of the Sacred Tooth Relic. It is also adorned with British-period structures; St. Paul's Cathedral features Gothic arches and stained glass.